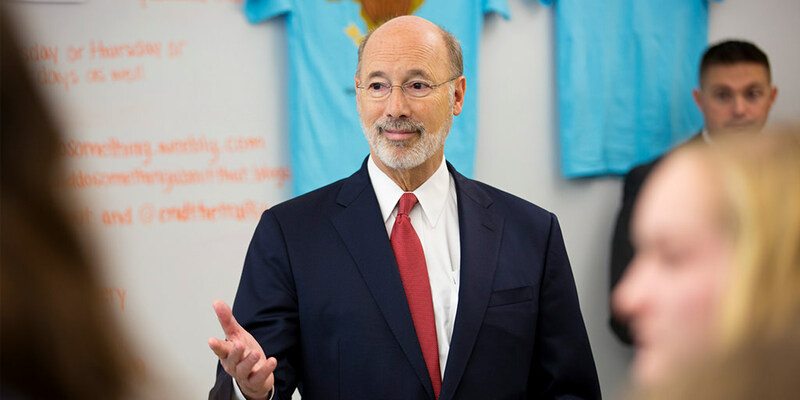 Harrisburg, PA – As students and teachers prepare for back to school, Governor Tom Wolf joined Secretary of Education Pedro Rivera and education advocates for a Schools that Teach event in Pittsburgh to announce students and teachers will spend at least 20 percent less time on the Pennsylvania System of School Assessment (PSSA) this school year. Currently, the PSSA exams take place during a three-week testing window identified by school districts and this schedule will apply to the shortened assessments in 2018. For test administration in 2019, the Department of Education anticipates shortening that window and moving it toward the end of the year to provide educators more time for curriculum instruction and to minimize disruptions to classes. The Department identified the PSSA changes during discussions with stakeholders for nearly a year when developing the Every Student Succeeds Act (ESSA) Consolidated State Plan. The plan is a federal requirement to replace the No Child Left Behind Act. Pennsylvania has become a national leader in STEM education, helping workers compete in the 21st century economy and build economic prosperity for working families.